After attending a black tie fundraiser at Stillwell Stables, Nicole (who works in the event industry) and Mike knew they wanted to get married there. The working stable hosts very few weddings – so once the couple received the go-ahead, the space needed to be completely transformed. Cue planner and event designer Paige of Gilded Lily Events and her team…who pulled together an amazing team of vendors to realize the couple’s vision. Originally only the cocktail hour was to be held under a tent, but the threat of rain forced the ceremony under one as well. 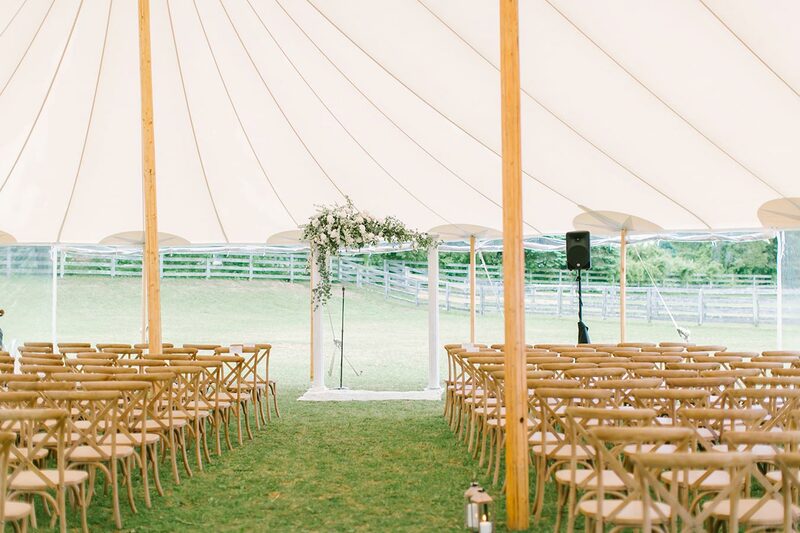 But this last-minute change by tent rental company Sperry Tents New Jersey ended up being a pleasant surprise: the sound of the raindrops hitting the sailcloth tent combined with the string quartet resulted in one of the couple’s favorite memories of their special day. Everyone headed into the barn for the reception, where draping, hanging florals, glittery chandeliers, and even a horse stall transformed into a photo booth delighted guests until the last dance. This wedding was featured on Style Me Pretty; see the full details here.